The memories are always there, just waiting for a reason to bubble to the surface. It can be the mouth watering smells, wafting out from a bakery, or the glow of a corn field as the day gets chased away by dusk. For me, it is often the first few bars of a favorite song. Today, driving back from Cedar Rapids, as the sun was setting, and the snow cover fields seemed somewhat less frigid, my childhood memories came knocking. As the car took me home, the radio took me back to 1976. I was nine years old, loved baseball cards, Casey Kasem, and a fun little song by Starland Vocal Band, “Afternoon Delight”. I remember sitting by the stereo, with a cassette in the player, and my finger hovering over the record button, just waiting to hear my new favorite song. At nine years old, I listened to the lyrics, “Thinkin’ of you’s workin’ up my appetite, looking forward to a little afternoon delight.” I imagined that the song was talking about eating bomb pops, which to me would be delightful. What else could it mean? “Gonna find my baby, gonna hold her tight, gonna grab some afternoon delight”, that is obviously a reference to snacking, isn’t it? Of course, those who were a bit more mature knew what the song was talking about, or so they thought. Though it is a romantic little tune, the ‘Afternoon Delight’, is in fact, a reference to the band’s favorite lunch choice, from Clyde’s in DC. I learned this many years later, while sitting at the Clyde’s in Chevy Chase Maryland. I looked down and saw the name of the sandwich on the menu, and when I commented to the bartender that there was a song by that title, she smiled, took the menu from my hand and flipped it to the back cover. There was the band, and the article explaining that the song was paying homage to the very sandwich I had ordered. My first set of 4 pieces of maple, which I had glued together, was not quite as brilliant as I had hoped. The ends had small gaps between a couple of the pieces, and there was a tiny gap in the middle as well. As a group, they were connected to one another with an iron grip, but that isn’t quite good enough. It is important that they be without gaps. The learning continues. I need to apply glue evenly across the entire surface of the board. I reasoned that if I used my little plastic scraper to press glue into the gaps. Another round of clamping and success was mine. There was a brief round of clapping from the gallery. I have read of the evils of squeeze out. How it can really mess up the look when one is applying finish. I wanted to avoid squeeze out, so I didn’t apply enough glue. As I looked at my gapless glue up, I took a heavy sigh and examined the amount of glue that was on the surface. I wasn’t sure how hard it would be to get rid of, but I was determined to continue my education, so into the vice it went. Out came my belt sander and I proceeded to run it across the edge until there was nary a smidgeon of glue. When the glue was gone, so was the unevenness of the individual pieces of wood. I thought that it was possible to grind down the edges of my glue up, with my belt sander, but I feared that I would get a really wavy surface. It was much flatter than I imagined. Would it have been easier to run it through a planer? I am certain that it would have been much easier. Would it be simpler to use a hand plane? Yes, it most likely would. 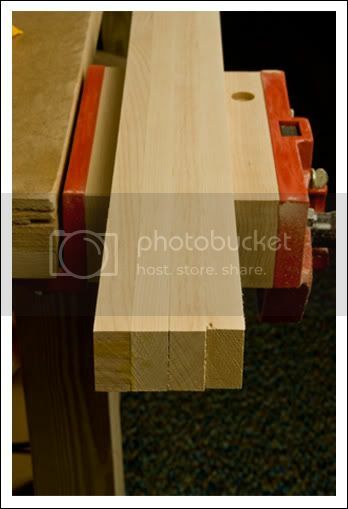 Am I, as a person without a planer or the correct hand plane, going to be unable to get a nice surface for my router table? I am not entirely sure yet, but I think it is entirely possible to simply sand it down, until it is flat. Actually Brian, the belt sander seems to be the tool of choice for “flatening” a top of this type. of course final flatening can’t be completed until all of the sections are glued together. For what its worth I slathered the glue on both sides coming together with a paint brush. and it was not brushed out. Of course this led to squeeze out, which I sanded off ( with my belt sander). I have brushed on a couple of coats of BLO wich will be the only finish used on the top and where the squeeze out was. That is good to know. I thought I would try to get them all close, before final sand up, and then give it one more round afterwards. Bolied Linseed Oil does seem like the way to go. We will see. I agree that you you will be able to sand it until it is smooth, but I think flatness is quite another matter. What basis do you have for thinking you can sand a large surface flat? Are you going to focus on the “high spots” with straight-edge? I don’t want to see you go bonkers. But I don’t speak from a great deal of experience either, so I may be completely wrong! On the other hand, maybe only the area near the cutting edge needs to truly be flat..and sanding may be sufficent to accomplish this. Wishing you continued good luck from the sidelines! I commend your efforts and observations through activity Brian. I think it would be rather difficult to achieve a full flat surface through the sanding method you are currently using. Part of the problem is the small surface area that your sander would have. 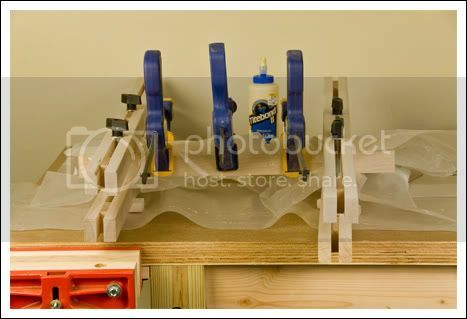 Face to face and edge to edge gluing is best accomplished if the board is jointed and planed. If you prefer to stick with hand tools, you might want to look at a jointer plane. Here is a link to a Lie Nelson model. Jointer planes are rather large in body. When attempting to true a board, the plane needs to sit on a larger surface area. This is why smaller planers, like a block plane for example, does not work as well. A new, high quality hand jointer plane will run you about the same price as a good quality power planer or jointer. If you go with a power tool set, you will need both a jointer and a planer. The jointer will flatten the face and edge, the thickness planer will surface it down to an even thickness. I will not say that a sander will not work, they do make drum sanders that function like planers. It just has to do with the complexities of attempting to flatten a large surface one small section at a time. Before your next glue-up, lay your boards down on a flat surface and shine a light on the bottom edge and look on the other side. It will help you identify areas where the board has gaps that will be problematic. I hope this helps and I am not just relaying what you already know. I have spent a lot of time at Lie Nelson the past couple of days, looking over their hand planes. I wasn’t sure which one would be best. Thanks for helping me know what I should be considering. If you don’t mind sharing my recent experiences. Hand planes….This might just lead you down the path of more and more tools…You will need the sharpening tools to get the planes to work properly, etc. Then, you probably get 20 good shaves before the magic wears out. After that it depends on how strong a back and arms you got. Instead I ended up getting alot of miles and succes from my ridgid 6 in jointer. It has made a world of difference. It is fast, accurate and cheap. My jointer and table saw cost the same as my jointer plane and jack plane from Lie Neilsen. Don’t get me wrong, I love my hand tools, but they only provide me confidence when I have to do something very detailed and controlled. Also those gaps between the boards magically dissappear when you pass your boards through the jointer. It is very satisfying to see a lamination assembly come together when there are no gaps. The recommendations about tools that do a great job of flattening do have a point. There is a lot of satisfaction in getting a task done well and quickly. However, I remember shooting pool many years ago. I was facing a difficult shot and I thought I needed to point out that my cue stick was curved. I got a very quick and terse reply – “It’s a poor craftsman who blames his tools”. I nodded in agreement and then made the shot. The world used to be flat. Check out E-Bay for planes. No need to spend a fortune to get that top flat. You make a good point sras and I agree, however, I know Brian is putting together a list of tools for his shop and I knew he was looking at planes so I threw a few suggestions of future tools his way. Here comes all that flattening advice from every corner. IMHO you will probably not be able to do it with a beltsander. Maybe you will, but I also like to sand, and I think not. Luckily you have a lot of thickness to play with, so go for it. When I have been faced with flattening such a surface (counter tops, bench tops) I have used a router in a sled that slides over the top. It works great to level the surface, then you sand it for smooth. Planes are how they are traditionally flattened, but are too much work for me. I refer you to another woodworking savant who said ”...I planned each charted course, each careful step along the byway, and more, much more than this, I did it my way…”, Frank Sinatra. When you’ve done it your way Brian, just slap a good phenolic slab on top, and it will be as flat as it can get. By the way, with all the talk of getting what you pay for and cheap tools wearing out, I’ll offer this. I’ve yet to have a cheap tool wear out. They seem to hang on a lot longer than you want them to, working just good enough to interfere with your decision to get the good tool. Beware the cheap tool curse. 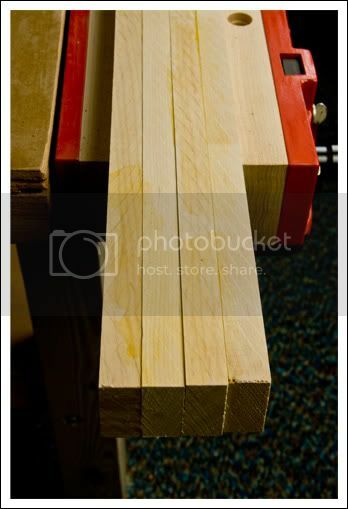 Question: would passing new boards through a 12.5” planer help with the (face-to-face) glue-up? Any sanding after the planing? I am really enjoying the discussion! Brian, Do a search on “scary sharp” before you lay out big bucks on sharpening equipment. Like it says in the Bible, “Count your costs” before making any big decision. There seem to be plenty of “hidden costs” in the woodworking game—I recently spent about $40 on silicon carbide sandpaper (for sharpening). Fine sharpening stones cost several multiples more but may be cheaper in the long run. Have fun!